Proactive policy protects your business from the stigma of a bed bug epidemic! How? 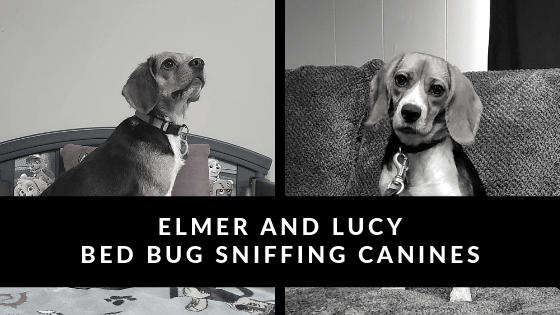 Our Canine Sniff Service can determine if you have bugs, pinpoint the location, save you time and money, and most importantly – YOUR REPUTATION! 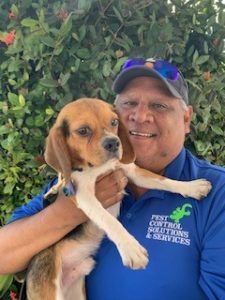 MANAGEMENT – Demonstration of the canine’s ability to detect bed bug infestations and Q & A session. The entire facility is inspected. Should the canines alert a bed bug infestation, vehicles are also inspected. The canine handler will walk through each area of the building prior to introducing the canine to the area. This is important for the safety of the animal. A Pest Control Technician is on site to visually inspect the area the canine indicated was an alert. The Pest Control Technician may or may not be able to confirm the presence of bed bugs. The canine (98% accurate) can smell 1 bed bug whereas the human (15% accurate) may not be able to see the bed bug behind or under obstacles. At the end of the day, a report will be prepared for management detailing the results of the sniff service. We can also provide a fee for treatment or you may use your current pest control provider. We recommend the entire facility is inspected quarterly. 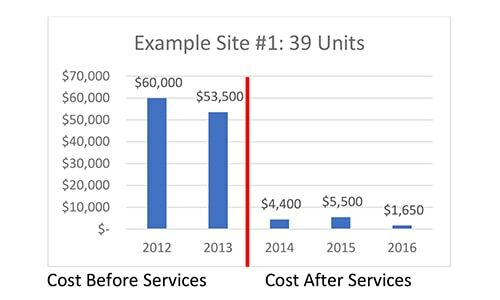 With proper treatment and proactive move in, move out, and quarterly inspections will reduce the number of units that require treatment. Most infestations are contained to a single unit instead of spreading to multiples of units in a building. 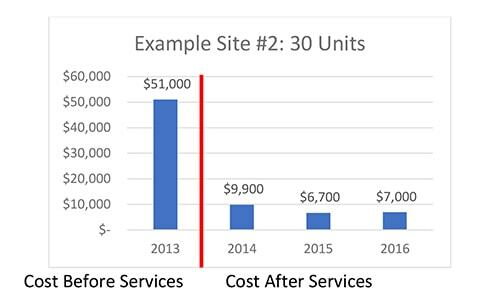 Showing reduction costs in multi-unit residential buildings. Please contact us to discuss reduction costs pertinent to your location. Example Site #1 – Building full inspection conducted December 2013. Cost includes sweep. Example Site #2 – Building full inspection conducted November 2013. Cost includes sweep. Beagles have an estimated 220 million scent receptors (humans have about 5 million)! Bed Bug Canines are 98% accurate in finding bed bugs (humans are 15% – 30% accurate)! Our canine sniff service will help you save money on treatments by catching infestations early! Our canine sniff service will help you retain employees and customers as a certified bed bug free establishment! If Lucy was a person she would be a type “A” personality! When she enters a home, an office, nursing home, hospital room, hotel room, apartment, car, bus or plane she has been trained to smell the room, catch the live bed bug odor, and pinpoint the exact location by methodically checking every room she enters. She checks low for bed bugs hiding behind baseboards and electrical outlets and catches odors high in the air emitted from bed bugs hiding behind decorations like picture frames. She has no fear…. she sticks her fabulous beagle nose deep inside couch and chair cushions. Lucy is a “rock star” among her peers and loves the hunt! If Elmer was a was a person, he would be the class clown! He is small in stature and has short snout. However, he has a BIG beagle bugle to go with his BIG personality. He keeps pace with Lucy’s type “A” work personality and get the job done everyday…. with style! When you watch him work you notice his expressive body language as he hunts for bed bugs. Subtle is just not his style…. he is so obviously pleased with himself! He checks low and high with enthusiasm to find the object of the game! 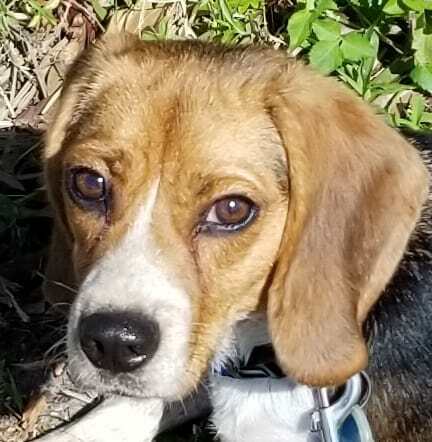 We love to brag about our smart beagles with their fabulous noses, however, the human trainers, handlers and pest control technicians are an equally important factor in providing an outstanding service to you. Stephanie Clinton is an enthusiastic and dedicated Instructor in the profession of detection through canines. During her twenty-seven-year career as a law enforcement officer in Texas, she began her journey as a dual-purpose canine detection handler. Excelling through the years she became proficient in many aspects of canine behavior and utilization to include; certifying official, evaluation, instruction and problem solving of tracking, patrol, narcotics and explosive detection work canines. Stephanie is a member of respected canine associations and has been presented with multiple awards and recognitions nationally and on a local level. She has been recognized professionally by her peers, Board Members, Chiefs of Police and her community to include being inducted into the American Police Hall of Fame, located in Titusville, Florida, for her work with scent detection canines. She has hosted and instructed multiple canine seminars keeping the tone exciting, challenging and rewarding for both working dog and human partner. Stephanie has donated her time to other police departments, and community members who are striving for success with their canine partners. 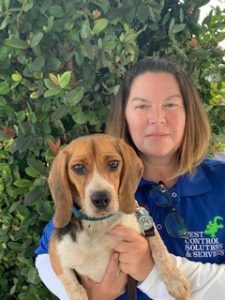 Stephanie is hard-working, confident and always keeping acquainted with the new advances in the field of canine bedbug detection work, ensuring exceptional bed-bug detection canine(s) are on your team when it is most important for the safety and health of you and your family. Victor is a retired law enforcement officer of 25 years. He is an experienced professional who was assigned as a Field Training Officer for over fifteen years and has been recognized multiple times throughout his career for his professionalism and valor. Victor was a Supervisor and a first-class welder, in the hydraulic business. He is an experienced kennel-tech and has completed a specialized canine handlers’ course with emphasis on scent detection work. He has played an essential role in training professional scent detection canines for law enforcement purposes. He has a patient demeanor making it easy to cultivate the handler – canine bond. During his off-time Victor likes to enjoy fishing and other outdoor activities. Bed bugs are extremely nomadic. They hitch a ride on people. If there are people, there is the potential for bed bugs! Places People Go,Places People Get Help,Places People Stay,Places People Work,Places People Ride In,And More! Don’t let the bed bugs bite and ruin your reputation! Our vehicles are simply marked as ‘pest control’. We are available before and after business hours. To respect your time by showing up on time and accommodating your schedule. To sell you only those termite or pest control services that you need. Not to nickel and dime you! A fair and reasonable price is provided at the time of your complimentary termite or pest control consultation. This price is the only fee we charge the entire year for our annual termite service or pest control services. From the initial phone call to the outstanding ongoing termite and pest control services, we are committed to making you and your family our top pest control priority! Receive $150 Off Our Triple Play Combo!